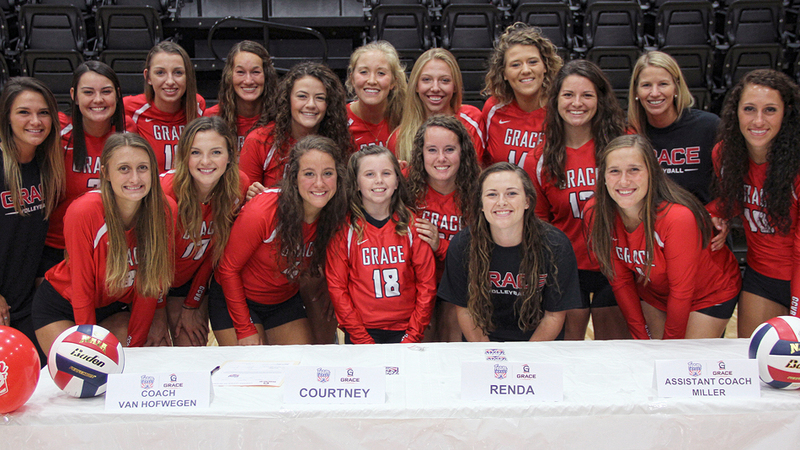 WINONA LAKE – Grace’s volleyball team landed one of its most exciting prospects in program history with the signing of 9-year-old Courtney. Courtney joins the Lady Lancers through Team IMPACT, a Boston-centered nonprofit whose mission is to improve the quality of life for children facing serious and chronic illnesses through the power of team. Courtney was diagnosed with juvenile arthritis at the age of four. That has since spiraled into multiple diagnoses that leave her missing school and sports for hospital appointments. She, along with her mom, were officially introduced as members of the Lady Lancers during a special Draft Day ceremony at the Manahan Orthopaedic Capital Center. Grace’s players and Director of Athletics Chad Briscoe were present to witness the memorable event on the court. “We are so excited to officially have Courtney as part of our team. She is such a blessing to us. She is encouraging and uplifting to us throughout the year, so we are excited to encourage and build her up as well during her battle,” said Grace head coach Katie Van Hofwegen. As an official team member, Courtney attends many of the team activities and sits with the Lady Lancers during home matches. The Lady Lancers will enjoy their home opener this weekend on Friday and Saturday with the Lancer Classic. The two-day tournament will see Grace play in four matches at the MOCC.